Guilin Boutique Lodge consists of three unique lodges in China’s Guilin area designed and built by Keren Su, a renowned photographer. These three lodges form a Golden Ring route, each located at a famous scenic spot, so you will be able to enjoy the best and entire scenery Guilin has to offer. We would love to provide a vehicle to meet you at the airport and train station and see you off if you need. We will discuss with you about your travel schedule and customize an itinerary. 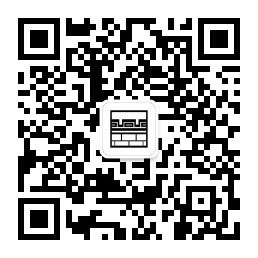 We can provide travel services for your entire China trip, including transportation, accommodation, English-speaking guide and vehicle. Any request you have, we will do our best to facilitate. Sitting on top of a mountain overlooking magnificent rice terraces, Li-An Lodge is located inside Longji Terrace Fields. There are two popular hiking routes taking you to the beautiful terraces and local villages. Route 1: Start from the lodge, hike to Viewpoint 2 where the terrace landscape resembles “Seven Stars Surrounding the Moon”. Continue on the trail winding along the terrace to reach Viewpoint 1, where the terrace landscape resembles “Nine Dragons and Five Tigers”. Return to the lodge through Ping An Village. The hike is about 4km, taking 2 hours. 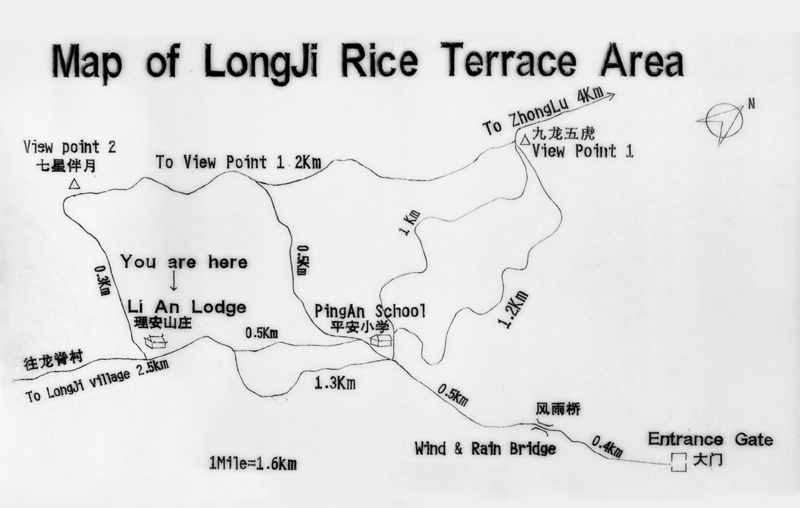 Route 2: Start from the lodge, hike to the ancient village of Longji. Return to lodge. The hike is about 5km, taking 2.5 hours. The village of Dazhai, mainly lived by the Red Yao people, is about 10km from Li-An Lodge. There are beautiful terraces in that region. This hiking is more strenuous and a round trip will take a whole day, so it is recommended to advanced hikers. Sitting by the Yulong River and surrounded by the undulating limestone hills, Li River Gallery Lodge is conveniently located along the famous Ten-Mile Gallery. It is steps away from the popular attractions including bamboo rafting, helicopter tour, Big Banyan Tree and Jinshan Temple, etc. From our lodge, you can ride a bicycle and easily explore the nearby sites. The old town of Yangshuo is a short ride of 6km away, where the popular Li River cruises ends. The new high-speed train station provides another convenient way for access in addition to the airport in Guilin. We would like to recommend the following sightseeing routes. From Chaoyang Dock to Gongnong Bridge, the ride on bamboo raft takes 1.5-2 hours. A 20-minute ride on a golf-cart like vehicle will take you to Chaoyao Dock to board on the raft. After the ride, walk back to Gallery Lodge from Gongnong Bridge, which is about 200 meters away. Route 1: Gallery Lodge/Moon Hill/Longtan Ancient Village: Start from Gallery Lodge, head towards Gongnong Birdge, turn left at crossroads and travel along G321 towards the south. Pass by scenic attractions such as Big Banyan Tree, Jianzhen Temple, Julong Pool, Jinshui Cave and reach Moon Hill. The distance to Moon Hill is around 2.4km, taking 35 minutes on foot and 15 minutes on bike. From Moon Hill, head towards the west for 2.6km (35 minutes on foot and 15 minutes on bike) to reach Longtan Ancient Village. Return to Gallery Lodge along the same route. 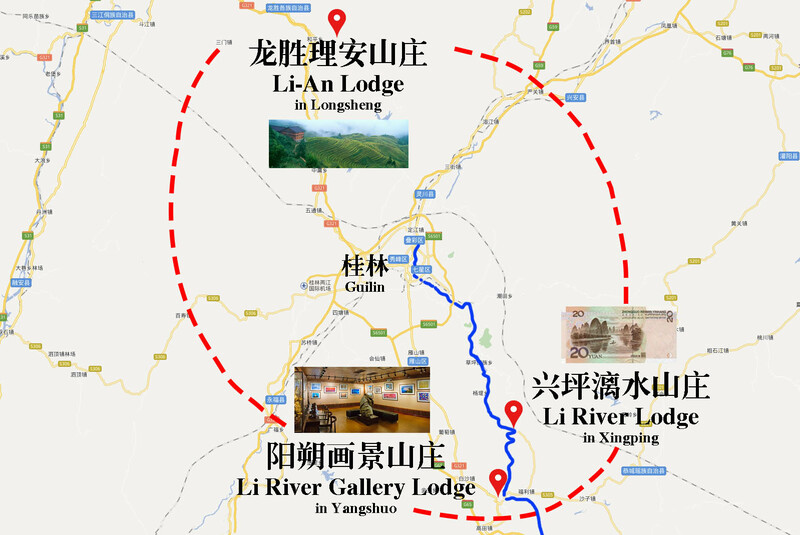 Route 2: Gallery Lodge/Ten-Mile Gallery: Start from Gallery Lodge towards the east along Yulong River. It’s a 3.5km stretch along scenic Ten-Mile Gallery. Reach Aishan Village. It takes about 50 minutes on foot and 20 minutes on bike. From Aishan, you have the option to return to Gallery Lodge along the same route, or continue to Yangshuo Ancient Town, which is 5km away, taking 75 minutes on foot and 30 minutes on bike. Route 3: Gallery Lodge/Yangshuo Ancient Town: Start from Gallery Lodge, head towards Gongnong Bridge, turn right at crossroads and travel along G321 towards the north. Pass by scenic attractions such as Butterfly Spring and Tuteng Ancient Trail. Continue north on G321 to reach Yangshuo Ancient Town. The distance is about 6km, taking 45 minutes on bike. This is an enchanting performance on the shores of the Li River in the town of Yangshuo. The waters of the Li River set the stage and a dozen beautifully lit karst hills form a natural backdrop. The light show is a creation of Zhang Yimou, the famous director of the 2008 Beijing Olympics. Two performances are scheduled each night and each show lasts an hour. There are 4 routes to choose from offering a dramatic view of the stunning Li River scenery from the air. Flight time and prices vary. The launching pad is a few minutes’ walk from Gallery Lodge. Located between Nine Horse Mural Hill and Reflection of Yellow Cloth in Xingping, it resembles a man wearing an official hat and costume of feudal China, hence the name. An easy 20-minutes hike will take you to the mountain top. You will be rewarded with a panoramic view of the Li River, embraced by rolling karst hills, makes a 180-degree bend here. It is about 30km from Gallery Lodge, a 45-minute ride by car. Located in the picturesque Huashan Villageof, Xingping, Li River Lodge is conveniently located near the Nine Horse Mural Hill Scenic Area. Xingping is where the river makes a big turn with undulating karst hills, turquoise water and verdant bamboo bush, the scenery featured on the Chinese 20 Yuan note. The fishing village of Xingping even attracted President Clinton. It is 2.5km away from Xingping Dock and Xingping Ancient Town, and the new high-speed train station is only 10km away. It is steps away from the popular attractions including bamboo rafting and 20 Yuan note scenery. Here are some sightseeing routes we have designed for you. 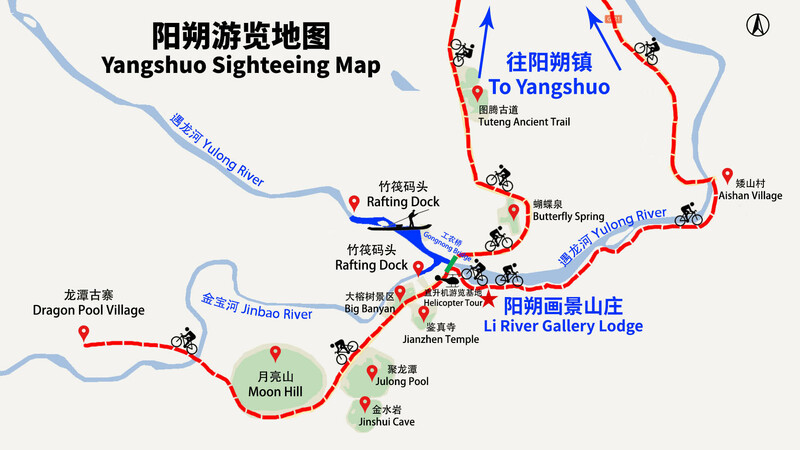 Route 1: Xingping/Yangdi/Xingping: Roundtrip ride on bamboo raft takes about 3 hours. The dock is a few minutes’ walk from Li River Lodge. Route 2: Xingping/Nine Horse Mural Hill/Xingping: Roundtrip ride on bamboo raft takes about 1 hour. The dock is a few minutes’ walk from Li River Lodge. Route 1: Li River Lodge/Xingping Ancient Town & Dock: Start from the lodge, turn left and walk along the Li River, pass by Viewpoint of 20 Yuan note scenery and dock for bamboo raft, and reach Xingping Ancient Town. The distance is about 1.5km, taking 25 minutes on foot. In Xingping Ancient Town, a 30-minute climb to the top of Laozhao Hill offers a panoramic view of the nearby scenery of Li River and karst hills. Route 2: Li River Lodge/Nine Horse Mural Hill: Start from the lodge, turn right, walk along the Li River for about 3km, taking 45 minutes on foot, to reach Nine Horse Mural Hill. Return along the same route on foot, or take a ride on a golf-cart like vehicle. Route 3: Li River Lodge/Nine Horse Mural Hill: Start from the lodge, turn right, bike along the Li River for about 3km, taking 15 minutes on foot, to reach Nine Horse Mural Hill. Return along the same route on foot. 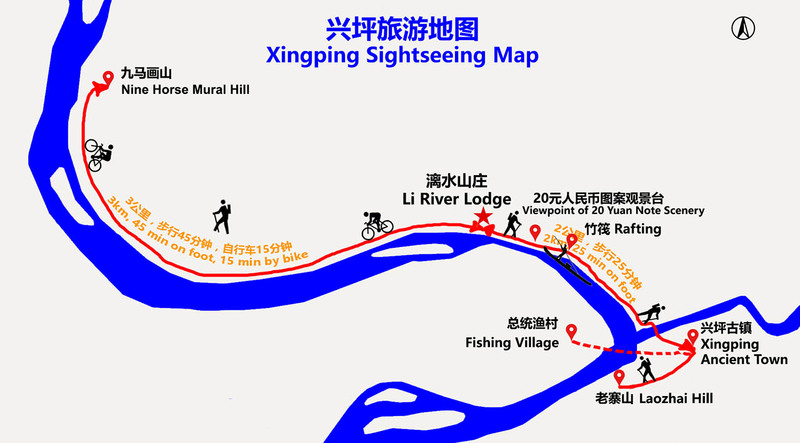 Start from Li River Lodge, head to Xingping Ancient Town on foot (25 minutes walk) or golf-cart like vehicle. Embark on cruise to the 500-year-old fishing village infused with rich southeast Chinese heritages, made famous by President Bill Clinton and Dr. Sun Yat-sen, the first president of the Republic of China. Along the way, beautiful scenery is displayed with many famous attractions. A roundtrip ride takes about 90 minutes.